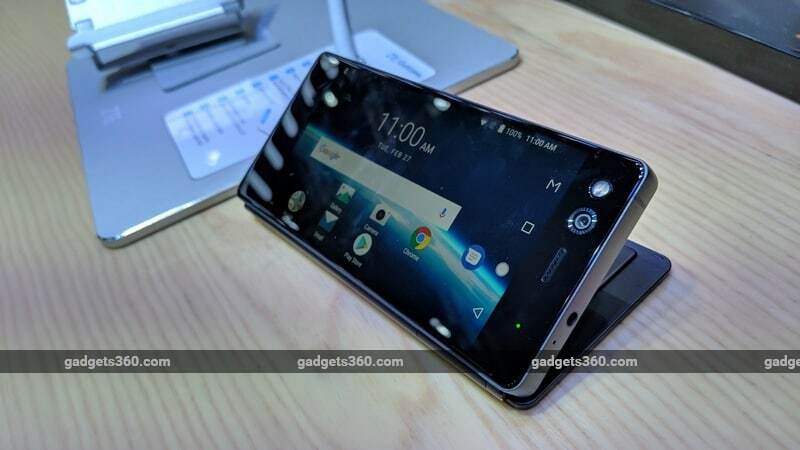 If you’re bored with your standard candybar smartphone and miss the days when phones came in all shapes and sizes, the new ZTE Axon M might appeal to you. It’s basically a clamshell smartphone, but instead of a keyboard, ZTE Axon M has a second screen that can be used in a variety of ways. It’s a bold innovation, but does it really make sense for the average user? Here are our ZTE Axon M first impressions. The new ZTE smartphone is obviously quite chunky, and reminded us of Nokia’s old 9000-series Communicator phones at first glance. All the demo units at ZTE’s MWC 2018 event were tethered, and so we couldn’t get an idea of how this phone might fit in a pocket though we don’t think it will be very comfortable. When folded closed, you’ll see a screen on either side of the Axon M. The secondary one will be turned off in this mode because it’s facing away from you. When you flip the phone open, the two screens line up perfectly, and that’s when the fun begins. You have a choice of screen modes, accessible through an extra button on the on-screen Androidnavigation bar. You can choose to duplicate the same content on both screens, stretch everything as if there was one big screen, use the two independently just like two PC monitors, or turn the second screen off entirely. While the thought of one big screen might be appealing, it’s effectively square shaped, so it’s useless for movies. The seam between the two screens cannot be hidden or even downplayed so it’s distracting, and reading pages of text would become aggravating. The Android UI seems to have no problem scaling to the different screen modes – ZTE has done well. However, not all apps will work, and it will be interesting to see how games run. If this concept is successful, we might even see apps designed to work around the seam through the centre. Dual-monitor mode seems the most interesting as you can multitask and make good use of the extra screen. If you launch the Photos app for example, you can have all the thumbnails on one side while any image you tap on will be loaded on the second screen. It can become awkward to hold this phone and use it in your hands, rather than laying on a table. There’s only one camera, on the front of the phone, because the back is blocked whenever the Axon M is folded. There’s absolutely nothing to see on the inner surfaces of the two halves. There’s a fingerprint reader along with all the hardware buttons on one side. Both screens measure 5.2 inches and have full-HD resolutions. The choice of a Snapdragon 821, which is several years old, is a bit curious. You get 4GB of RAM and 64GB of storage, plus a 20-megapixel camera. Dolby Atmos is there, along with Wi-Fi 802.11ac, dual speakers, and all the modern conveniences. ZTE doesn’t launch a lot of phones in India, and we don’t have confirmation about whether the Axon M will come here at all. If or when it does, we’ll put it through all our usual tests and spend enough time with it to give you an idea of how it might work as your next primary device.